Disclaimer: Please note that this product is now supplied in 10ml bottles, though the image above may feature an old 20ml version. 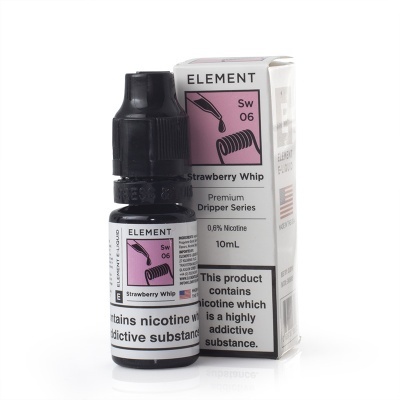 Element have whipped up a delight with the Elements Strawberry Whip E-Liquid, a smooth blend of strawberries and cream to take you to vaping heaven! Sweet, indulgent and creamy, this is perfect for those reminiscing about summer days gone by. 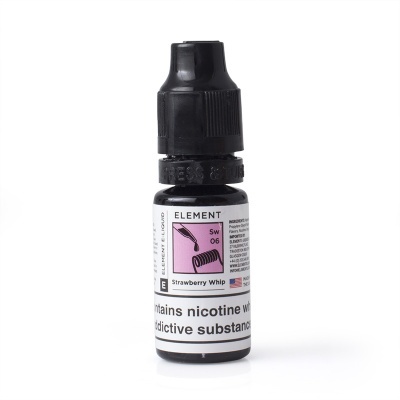 Element are a manufacturer based in Florida who pride themselves on only using the highest quality ingredients. Their range of flavours means there is something for everyone. Strawberry Whip E-Juice is available in 10ml and three different strengths. A child-proof applicator is supplied with each bottle. Some of our stock of Dripper Strawberry Whip E-Liquid is due to expire soon. In light of this fact, we are offering the affected stock with a discount! This offer is only available while stocks last, so act quickly to save! Strawberry whip is a luxurious blend of fresh, ripe strawberries and smooth, rich cream for an indulgent and delicious combination. Strawberry Whip has a combination of 80/20 (VG/PG) for a smooth vaping experience. Strawberry Whip is supplied in 10ml bottles only.